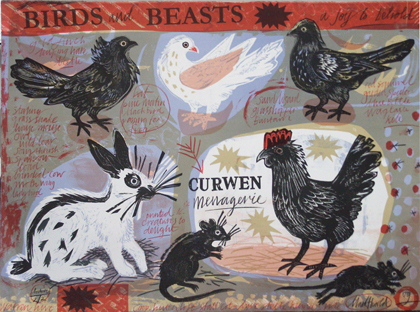 Graduating in 1997 with a BA (Hons) in Illustration from the Glasgow College of Art, Mark Hearld went on to complete an MA in Natural History Illustration at the Royal College of Art and now teaches illustration himself at York College. His work is based on his observations of the natural world, and he is influenced by neo-Romanticism, 1930s Modernism and British artists such as Eric Ravilious, John Piper and Edward Bawden. 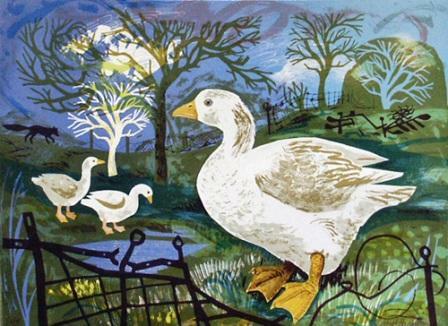 Mark works in a variety of mediums including linocuts, painting, collage and hand painted ceramics. He has completed commissions for Faber & Faber and Tate Britain, and recently produced art for the set of the film Nanny McPhee. He has also illustrated several books, the latest of which, ‘A First Book of Nature’, is to be published by Walker Books in May 2012.